Brackley Town’s clash with FC United of Manchester next week has taken on even more importance following a sixth Vanarama National League North outing without a victory. Despite taking the lead in Saturday’s game with Alfreton Town, Saints lost 4-1 and had skipper Ryan Austn sent off to remain firmly in relegation trouble. Steve Diggin broke the deadlock at St James Park with a 26th minute opener when he lobbed Matt Duke despite the former Northampton Town keeper getting a hand to the ball. Saints created numerous chances to increase their lead and Diggin had the ball in the net again on the stroke of halftime after a fine move but it was ruled out in a tight offside decision. Alfreton’s sole chance in the first half came after Lindon Meikle’s run and shot that Sam Hornby dealt with comfortably but the second half saw the game turned on its head. In the 54th minute Saints conceded possession allowing Meikle to break away carrying the ball fully 60 yards before finding Sam Jones who beat Hornby. Within two minutes the visitors had the lead, winning a penalty as Dan Bradley was hauled down in a position of no particular danger. Bradley got up to take the spot-kick which Hornby saved but the Alfreton skipper reached the rebound first to put his side into the lead. 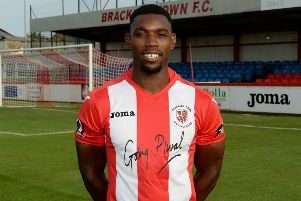 In the 63rd minute Saints captain Ryan Austin was sent off for a challenge on Bradley before the Reds bagged two more goals in the space of two minutes as substitute Ryan Wilson skilfully chipped Hornby in the 75th minute and Pablo Mills scored an own goal following Bradley’s cross from the right which summed up a miserable second half for Saints.